There are many different cardio modes of exercise. A few examples are brisk walking, jogging, running, treadmill, biking, stationary cycling, elliptical machines, swimming, jumping rope, aerobic classes, climbing stairs, etc. The key is finding the one you will enjoy (or for some, that you will hate the least) and do it consistently. You may want to give this some thought when deciding which of the aforementioned activities you will choose: Walking for 30 minutes will burn approximately 180 calories, whilst 30 minutes on an elliptical machine can burn more like 300 calories. Yes, it is a bit tougher, but I, personally, would rather work a bit harder for less time and a better calorie burn. However, you can increase your calorie burn by adding sprinting, hills, or an incline to your walking. NOTE: NO CATS WERE HARMED IN THE CREATION OF THIS WEB SITE. 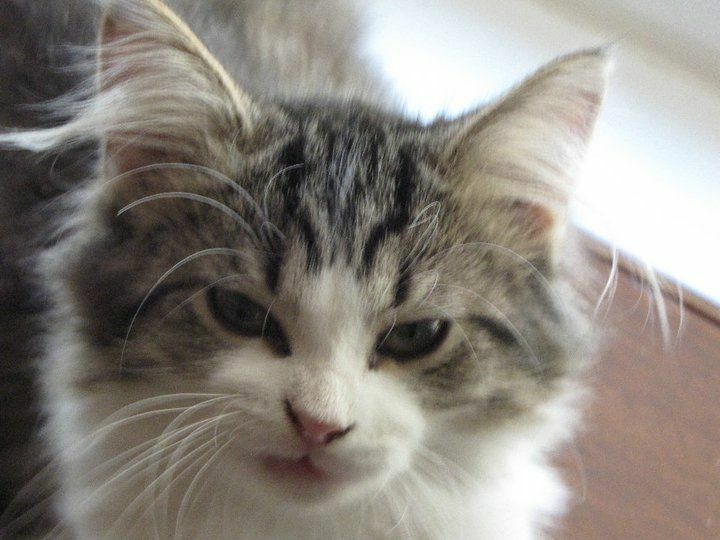 This is a pic of my favorite cat ever, Delilah. Isn't she cute? So what I mean to say is there are lots of ways to do cardio. Let's explore a few, shall we? This is the long duration (usually 45 minutes to an hour) at moderate intensity way. The theory behind this is that you burn more calories from fat than carbs and it is easier on the joints; hence, older, less fit bodies who may not be able to handle high intensity workouts may find this more suitable. ATTENTION: Just be sure not to be lulled into complacency with this longer duration. You still need to reach a training heart rate zone. You can split the time up with cross training. This is done by mixing it up with a couple of modes, i.e., 60 minutes of cardio can be split into 20 minutes on the stationary bike, 20 minutes on the treadmill, and 20 on the elliptical. It's a great way to stave off boredom. Tip: I like to read while doing cardio so that I forget about the time. It makes me feel doubly productive. 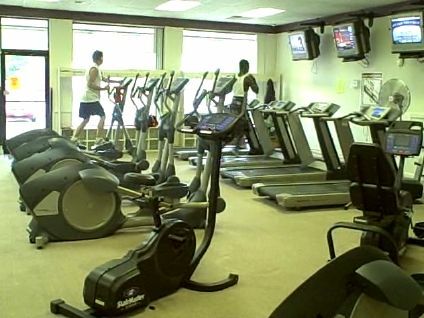 Some people like to watch TV while exercising. Anything that will help you hang in there until your time is up has got to be a good thing. This involves alternating relatively more intense bouts with less intense ones such as walking and running on a treadmill or changing intensity levels on an elliptical machine every few minutes. Click here for a sample or two of interval training routines. Then there is HIIT training, which stands for high intensity interval training. This is done by alternating short burst of high intensity with active recovery, which is typically a less intense form of the original activity, i.e., warm up for 5 minutes then do 1 minute at high intensity and 2 minutes at moderate, then back to 1 minute high, etc. for the duration of anywhere from 6 to 15 minutes then cool down for around 5 minutes. You can be creative with those parameters. Then there is the extreme HIIT cardio mode where you do intervals of short bursts where you go as hard as you canfor 15-30 seconds and slow down to a moderate pace for 1-3 minutes until your heart rate returns to about 45% to 50% of max heart rate and then do another 15-30 second all out, and keep up that pattern for a duration of no longer than 20 minutes. TIP: This is not for sissies. It is intense!!! HIIT has gained in popularity since studies purport that the exerciser’s metabolism reaches a more heightened state for a longer period of time after high intensity intervals, assuring the performer of continued fat burning effects. Cardiovascular conditioning is achieved much sooner according to studying physicians. Obviously, this is not for a beginner or someone in poor physical condition. You will want to have been exercising for a couple of months before trying this mode. The way I see it, it couldn’t hurt to throw HIIT into your routine a couple of times a week in the place of a 45-60 minute routine. Let’s see 12-20 minutes versus 60…you do the math. Almost sounds to good to be true, but studies say…and people are swearing by it. I am trying it as we speak, as I recently started a HIIT routine twice weekly along with a couple of 45-60 minute routines per week. I will cast my vote in a few months. Choice of cardio routine is a personal preference type of thing. This whole exercise experience really is one big fat experiment, pun intended, because people are like snowflakes…no two are exactly alike and we all react a little differently to things. That’s why one cookie cutter exercise routine doesn’t work for everybody. So just experiment and try new things. The main thing is to do something. Get off the couch!! Put down that candy bar and MOVE!! For more info about cardio, check out all the cardio pages on this site. Or you can check out my cardio eBook by clicking on the ad at the top of the page or clicking here.